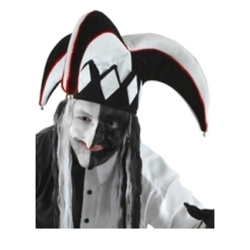 Be dramatic and be funny in this black and white, classic, three-armed jester. The details in the panel sewing, red cording and jingle bell accents say; you may be a joker, but you are serious about quality. Fabric lining, secret pocket with fortune, fits up to 60 cm heads (23.5 inches).